If you believe that literature has the power to change the world, then you will love Comeback Wolves. It's beautiful, important, and full of wild hope." "Read the strong, clear voices in these pages. You will find yourself ever more resolved, or newly convinced, that western landscapes cannot be whole without the gifts that the wolf brings to the plant and animal communities--and to us." "The wolf is returning with or without us. The only thing in doubt is whether we're up to sharing the West with these native sons and daughters. Read this book and grab hold of the only future fit to live." "This treasure of superb writing should be in the hands not only of those who support wolves, but more important, in the hands of those who don't--be sure to give a copy to someone who is unconvinced of the necessity of wolves, and help foster the understanding to bring those five-partite footprints back to Colorado." "Wolves are coming back to Colorado and the Southern Rockies. I think this little book will help them." 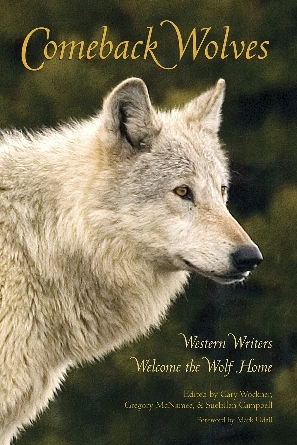 "Comeback Wolves is a wonderful and timely collection of essays and poems in honor of Wolf. If only wolves could read they would surely feel much more welcomed than they frequently are. Enjoy and share this book widely." Royalties: from the sale of this book are donated to Defenders of Wildlife's Proactive Carnivore Conservation Fund which works throughout the American West to prevent conflict between imperiled predators and humans before it occurs. Purchasing: ISBN 1-55566-365-6. Wholesale ordering available now from Johnson Books, (800) 258-5830. Retail available from The Tattered Cover and Amazon. Press Kit: Interviews, event scheduling, review copies, etc. are handled by Gary Wockner and Linday Doyle at Johnson Books. Please send an email. To learn how Comeback Wolves was created, read: "Show Yourself and Others Will: Connecting Art and Politics in Comeback Wolves" reprinted from divide magazine, Fall 2005. Publisher: Johnson Books, Boulder, Colorado. (800) 258-5830. Photos from the Center of the American West event. Editors: Gary, SueEllen, and Gregory outside the Boulder Teahouse, Jan. '05. Cover Photo: by Diane Hargreaves, taken in Yellowstone National Park. Reprints: For reprint permission, contact the individual author or Gary Wockner. Reprints/excerpts have so far been published in the Los Angeles Times and Mountain Gazette. Forthcoming in Inside/Outside Southwest Magazine and Natural Resources Journal.